(Synopsis) From #1 New York Times bestselling author duo Erin Watt comes the addictive contemporary tale of a teen rock star in need of an image makeover and the teen girl hired to be his fake girlfriend. I'm very choosy when it comes to my YA contemporary romance selections. 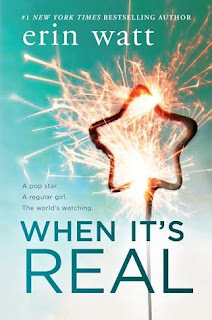 Although I've heard of Erin Watt before, I had never read any of her books, but based on the description (I LOVE the regular girl/rock star trope) and recos from trusted friends, I gave When It's Real a try, and it proved to be a winner. When It's Real was devoured in hours. Erin Watt was able to hook me in to the story and get me invested and involved in Vaughn and Oakley's lives in mere pages. I wanted to know why Oakley needed to clean up his image at only 19, why he is estranged from his parents and why he seemed to have a love/hate relationship with his job. And I wanted to know what kind of person Vaughn had to be in order to accept big money to be the fake girlfriend to a rock star who she doesn't even like. As Vaughn and Oakley mug for the paps and play up their fake relationship all over social media, it was everything that was going on behind the scenes that made this book magic. When they stopped throwing shade at each other and started really learning about one another and getting to know each other, they grew from enemies to friends. That's when my questions about Oakley and Vaughn were answered, and I started asking new ones. Like, will they just KISS already?! Vaughn and Oakley were amusing as enemies, adorable as friends, but as a real couple with real feelings, they were amazing. Vaughn realizes that Oakley isn't just some brainless chart topper, but a truly talented musician that is being stifled by the fake adults in his sphere. Oakley learns of Vaughn's tragic past and about what a hard worker she is for her family, but that she has no clue what she wants to do with the rest of her life. And they each care about those things and about trying to make them better for the other person. Vaughn gives Oakley a taste of selfless real that he hasn't ever gotten anywhere else. She didn't mock me when I confessed I was blocked. She tried to comfort me with silly stories about her family even when it was obvious those same memories caused her pain. She doesn't expect anything from me beyond what we'd agreed upon. She's different and I wanted a taste of that. I wanted to know what it felt like to be her, and the only way I knew how to do that was to put my mouth against hers. Everything about When It's Real is incredible. From Oakley and Vaughn to the host of side characters, including Vaughn's sister Paisley and Oakley's bodyguard Ty. When It's Real was one of the best YA contemporaries I've ever read.